KIEV, Ukraine -- Ukraine on Monday hosted the 15th annual summit with European Union (EU) leaders aiming at deepening cooperation. 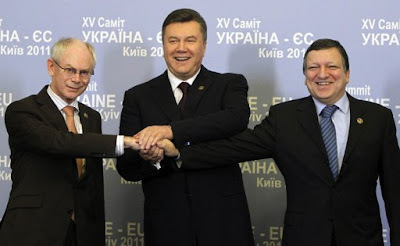 Ukrainian President Viktor Yanukovych (C), EU Council President Herman Van Rompuy (L) and EU Commission Chairman Jose Manuel Barroso join hands during their meeting in Kiev December 19, 2011. A summit between the European Union and Ukraine seemed headed for failure on Monday over the Kiev leadership's treatment of jailed opposition leader Yulia Tymoshenko instead of showcasing - as once planned - the launch of a new strategic relationship. The political situation, economic relations, mobility issues and regional and international relations were decided as priority topics on the agenda. But the main issue for Kiev was signing an Association Agreement (AA) -- the deal that was to take Ukraine a step closer to membership of the 27-nation bloc. Ukraine's EU bid, which was repeatedly declared by the authorities, has been shaken after the conference. The delegates to the summit did not as planned sign the EU-Ukraine Association Agreement, which includes arrangements for a free trade area and a roadmap for abolishing the visa regime for Ukrainian citizens due to unresolved political issues. European Council President Herman Van Rompuy told the summit that EU was concerned about the politicization of Ukraine's court systems, and the lack of freedom of speech and assembly. Though EU hopes to carry out steps toward signing the association agreement as quickly as possible, but this, he said will depend on political circumstances in Ukraine. Ukrainian President Viktor Yanukovych, for his part, was tolerant after the meeting, saying that Ukraine was satisfied with the results of the forum. He added that that Ukraine would continue comprehensive transformations in the country, and confirmed that both parties agreed to speed up preparation of the text of the Agreement for initialing. The deepening relations between the EU and Ukraine is in the interests of both parties. For Ukraine, it is advantageous from an economic point of view, as well as political one. The European Union market is the largest in the world. It covers 27 countries with more than 500 million consumers with an average annual income of about $40,000 U. S. dollars. This is a good foreign outlet for Ukrainian goods. Ukraine is already in Europe geographically, therefore, the visa-free regime will be very useful for tourists from Ukraine. In addition, partnership with such a strong player in the international arena will bring political dividends to Ukraine. These factors together will raise the prestige of Yanukovych and the ruling Party of Regions, before the Parliament elections in October 2012. At the same time, Ukraine is a big and geo-strategically important state for Europe. Brussels wants Kiev to become its strategic partner to increase its influence in Eastern Europe. Ukraine attaches great importance to its European identity, especially those Ukrainians living in Western regions. According to a poll conducted by the Kiev-based International Institute of Sociology in October, 33 percent of Ukrainians want to enter the EU. But at the same time, there are more pro-Russian citizens in Ukraine. Forty-five percent of Ukrainians support joining the Russian-led Customs Union. There is no doubt that all of them will support Ukraine entering the Eurasian Union, if it is created. After the Association Agreement signing was delayed on Monday, Ukraine seems to be more interested in economic integration with Russia rather than with the European Union, which constantly creates new requirements for Ukraine. After the controversial outcome of the summit, Russia is likely to try to strengthen its cooperation with Kiev, because Russia Prime Minister Vladimir Putin sees Ukraine as a crucial part of his plan to reintegrate former Soviet republics into a new Eurasian union that would rival the EU. Moscow is seeking to allure Ukraine into the Eurasian Union with cheaper gas and other financial benefits, which is very important for Kiev. Modifying the unfavorable gas deals of 2009 is in Ukraine's priority interest. In addition, Moscow is not as critical as the EU in the so-called "freedom questions." It is always very hard to make political forecasts, but most likely frustration at the EU summit will push Ukraine towards Moscow. Where this will eventually lead remains to be seen. However, one thing is for sure: the side that would be the first to understand the political importance of Ukraine and propose Kiev a really advantageous cooperation will benefit.